Choose this day which you will serve: God's Word or man's traditions! Torah! Torah! Torah! is an encouragement for those who are discovering Torah. Whether you are new to Torah or years along, you will see: How the Church came to reject Torah, and what the Bible itself has to say about that; God's appointed times when He promises to meet with us and how these appointed times are fulfilled in Yeshua; Answers to the traditional objections to Torah; How the Church can grow in love; Praying in Hebrew. Torah is for Today! 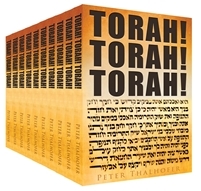 The first chapter is Torah's Ninety-Five Theses, the Bible's argument to return to Torah, which crushes traditions of men who say that Torah is not for today. See Reviews, a sub-category of Books. This Torah! Torah! Torah! T-Shirt is quality made with digital printing and soft, 100% pre-shrunk cotton. The Hebrew text on the front is the same as the cover of the book Torah! Torah! Torah! By using the more expensive digital printing process, this Hebrew text is easy to read and beautiful. You will probably get complements when you wear this shirt. Or you may have people stop and try to read your shirt, testing their Hebrew! Either way, this T-Shirt is a great conversation starter. The Hebrew text is Leviticus 10.13-16. Verse 16 (part of the verse, since the scroll column ended there) contains the two middle words of Torah according to the Masoretic scribes: דרש דרש darosh darash, translated diligently sought. Each דרש falls in different halves of the Torah. This is when Moses diligently sought the goat of the sin offering, but it was gone. The first Tabernacle in the wilderness, the first altar, the first fire from Heaven, the first sacrifice for sin for the congregation of Israel--it was missing! As a student of Gamaliel, Paul was required to memorize Torah, so he would think of this passage when he wrote 2 Corinthians 5.21, "For he hath made him to be sin for us, who knew no sin; that we might be made the righteousness of God in him." Yeshua completed this missing sacrifice for the congregation of Israel. And Hebrews 9.11-12 says that Yeshua carried His own blood into the Tabernacle in Heaven. So when Yeshua said in John 5.46 that Moses wrote of Him, this may be one of the verses He meant! The back of this T-Shirt quotes Psalm 119.18, "Uncover my eyes, and I will behold wonders from your Torah." This is the promise on which Torah-seekers everywhere depend. One final note: the book cover, and therefore this T-Shirt, were designed by Jesus Cordero, whose name means Yeshua the Lamb! This CD is how you can learn to read the Bible in Hebrew. For two years, I read the Torah portions each week with this program. It paid off with confidence in correct pronunciation and translation. And with this program, beginning students can read right along with advanced students in a Hebrew study group because each verse of the Tenach is written in English, Hebrew, Ancient Hebrew, and Transliteration. This is the main tool I recommend in Hebrew / Read the Bible in Hebrew on this site on the Hebrew page. See the picture of the first page, Genesis chapter 1, and remember: once this program is loaded onto your computer, you can enlarge the page as wide as your screen for easier reading. From the moment you have downloaded the CD onto your computer, you can begin to read any verse of the Bible you choose with correct pronunciation: Torah, Prophets, or Writings. Do you have a favorite Psalm? Aaronic Benediction? Read it in Hebrew! This program was developed by Dr. Danny Ben Gigi (pictured). Born in Israel, Hebrew is Danny's native tongue. He went on to teach Biblical Hebrew at Arizona State University for fifteen years. Now he writes and publishes Hebrew literature and software through his company, Hebrew World. You can trust Danny's scholarship. He went over every syllable of the entire text of the transliteration to make sure it is right. He told me that it was by far the biggest editing challenge he ever undertook, and I believe him! "And many nations shall come, and say, Come, and let us go up to the mountain of the LORD, and to the house of the God of Jacob; and he will teach us of his ways, and we will walk in his paths: for the Torah shall go forth of Zion, and the word of the LORD from Jerusalem." Hebrew is the language of Torah and Israel. This Hebrew-English Phonetic Bible is your first step to fulfill this prophecy. Torah! Torah! Torah! Save $5 by buying 3 at once, and shipping/handling is just $5 for any order anywhere in the continental U.S. Give as gifts to friends who need to hear about the New Covenant: Torah written in the heart. Torah! Torah! Torah! Save $20 by buying 10 books at once, and shipping/handling is just $5 anywhere in the continental U.S. on any size order. 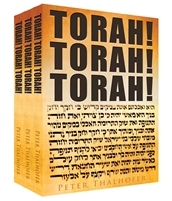 Get the word out to friends and family: Torah is for today. Or purchase as a Bible study resource...challenging centuries-old traditions with Scripture always leads to interesting discussions! 20 or more books, $10 each. 50 or more books, $8 each. These special prices are arranged through peterthalhofer@gmail.com. $5 shipping in the continental U.S. still applies at these discounted rates.